I bought this shirt from Old Navy and it immediately entered heavy-rotation in my wardrobe. It’s soft and warm but not so soft that it’ll get weird when you wash it and not so warm that you want to beg a restaurant to turn the heat down. It comes in stripes and solids and all of them have this sort of heathered look. At this point, I have this shirt in the blue pictured above, dark AND light grey, black and white stripe, and burgundy and white stripe. I’m basically planning on wearing some version of this shirt until June. Bonus, because it’s from Old Navy, I’ve never paid more than $15 for one, and some I got for like $5. I ADORE Roswell, the turn of the 20th century TV show that uses being an alien as an allegory for puberty. The CW has now rebooted Roswell, with a few changes. The show is now Roswell, New Mexico has the same basic premise, but the character are in their late 20s, and now the “alien” double meaning refers to undocumented immigrants. It’s… fantastic. I know people just HATE reboots of beloved entertainment properties, but just like thinking a movie that merely takes place at Christmas is a “Christmas movie,” this is not a good or interesting take. Roswell, New Mexico has enough of the original Roswell to make fans like me nostalgic, but it also makes some big changes that not only update this 20 (TWENTY) year old show, but separate the two iterations from each other. You can, and should, love both. Not only are the characters older, but Max is a cop, Nick is a doctor (and he learns about aliens right away), and Michael is gay AND he hooks up with Alex in the first episode. The thing that made me grin like a madwoman the MOST, though (and trust, I was shrieking with delight at every new take on this beloved series) has to do with Liz investigating the death of her sister. Through Max saving Liz’s life at the Crashdown Cafe, she sees his memories - including him seeing her sister on the day she died. This is also when Liz and Max realize that they’re an intergalactic OTP, but in Roswell, New Mexico Liz takes the added info about her sister and decides that she’s sticking around not to smooch on a hot alien, but to CRACK THE CASE and BEAT UP SOME ALIENS. This is a genius twist. After all, what teen soap watchers want in 2019 isn’t just star crossed love, but VENGEANCE. In the morning I “wash” my face by swiping some Bioderma on and calling it done. I have been using disposable cotton pads, but using one every day is A LOT. My little bathroom trash can is filling up fast, and it’s not necessary. 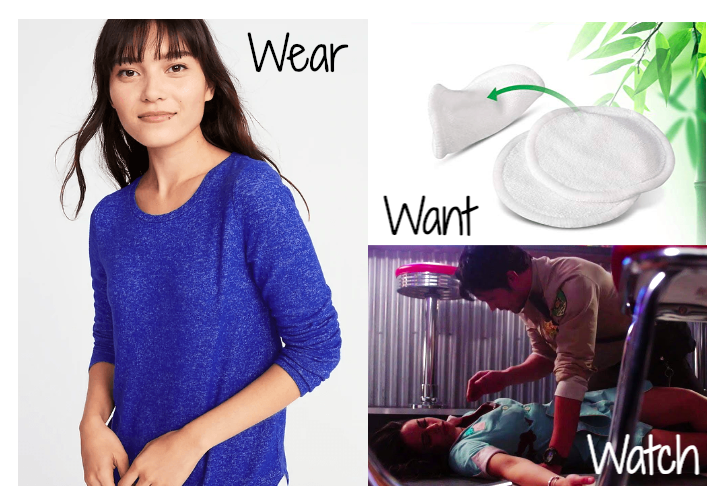 I want to give reusable cotton pads a try (they’re made of bamboo cotton, actually) and see if they’ll work as well. You can get a bag of two week’s worth for relatively cheap, and they come with a little wash bag to make laundering them even easier. There are still plenty of other single-use things in my daily routine, but this is one small step I’m hoping to take to ease my environmental anxiety.